Click on your avatar at the bottom of the main menu to access your profile and settings. Find user-specific actions, a list of recently opened items, and useful reference information. Set the system display language. Change your login password (may be disabled by system admin). Select where, when, and for which groups you want to receive notifications, or choose a new notification sound. Use the first three columns to choose when to receive internal notifications (below). The rightmost column enables email notification as well. Internal notifications cannot be disabled. Consult the admin documentation for details on how to customize these email notifications. Schedule out-of-office periods in advance, and designate a substitute to handle your tickets while you’re gone. 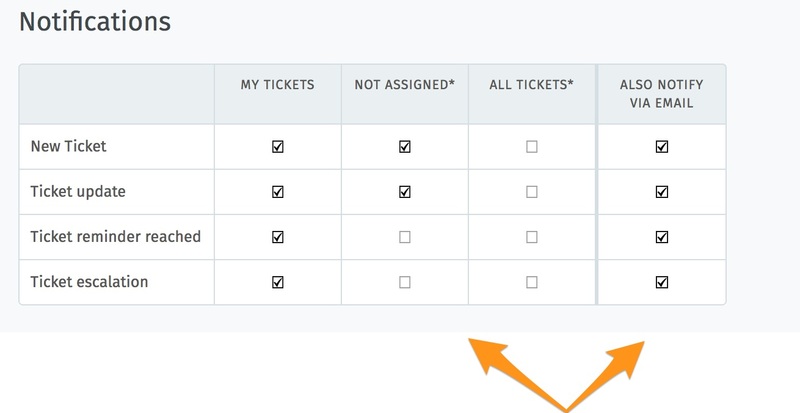 Your substitute will receive all your ticket notifications during your absence, and have a custom overview created to help keep track of your tickets. 🔔 You will continue to receive notifications while you are out-of-office! Add your ticket deadlines to your own favorite calendar app with the ICAL link listed at this settings panel. See a list of all devices logged in to your Zammad account (and revoke access, if necessary). Generate personal access tokens for third-party applications to use the Zammad API. See a list of third-party services (e.g., Facebook or Twitter) linked to your Zammad account.